These innovative, market-leading firms share dos and don’ts when approaching this hard-to-predict vertical. Think of the CI Industry Leaders as power rankings. We recognize the top integration firms serving 12 vertical markets, not purely by revenue but by a variety of factors including reputation, innovation and market approach. Put another way, these are companies that are making waves and worth watching. CI spoke to five retail market integrators about what helped them succeed (or fail!) at every step along the way. Check out what they have to say and click here to download the complete report, Meet the 2014 CI Industry Leaders. “A strong background in retail operations [helps]. That is a benefit to our clients, because we can see both sides of the street. You may fail if you don’t appreciate that retail customers require interactivity. One of the biggest threats to the brick-and-mortar stores is that customers can use their smart phones in the store to compare prices and leave without buying anything if they find a better value elsewhere, according to Goldsmith. Want to Attend CI Summit in Orlando? Apply for an invitation to 2014 CI Summit in Orlando, Florida, Nov. 12-14. But while brick-and-mortar retailers offer the instant gratification factor that doesn’t come through online shopping though, more retailers should explore setting up automated service kiosks in their stores, Goldsmith says. You also must appreciate how important demonstrating ROI is. She says one of the keys to Edwards Technologies’ success is that it has honed its ability to demonstrate ROI to clients. The integrator actually mocks up the custom solution and creates a prototype to illustrate during a presentation how it will generate traffic or transactions. Goldsmith agrees that articulating ROI is extremely important — maybe even a sticking point. It’s not always easy (or genuine) to attach a dollar amount to an integrated solution, so Ping HD sometimes prefers to articulate a solution’s benefits to a retail organization’s marketing team as opposed to trying to crunch numbers with operations or financing executives. 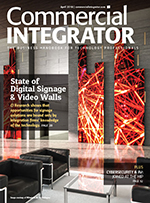 “People in marketing are more open to seeing [digital signage] as a visual communication tool, and aren’t as focused on cost,” he says.